It almost feels like covering an old story, so herein we mention only a few new developments and reference the rest at the bottom. As many have realised before the week ended, Microsoft is not in a good shape. It’s nothing like it used to be, but Microsoft goes out of its way to keep up appearances, even using aggression. Perceptual momentum is essential for growth through customer obedience and investor confidence. “Ask what it is not telling you. It has plenty to conceal.”Just as predicted, Microsoft emhasised revenue, which the massive acquisitions make rather meaningless (buying revenue is easy at the expense of savings). Those who have read this site for a while might not be surprised, but the Microsoft-owned press can be hugely self-serving, i.e. deceiving. Contradictions to it can be painted black… like a black sheep that Big Lies make possible. Microsoft shares fell sharply, just as they did in the previous quarter when profits fell and Microsoft was no longer able to pretend and conceal its pains. This marked the beginning of a stage where we are likely to see Microsoft’s estimates and forecasts lowered and then potentially missed again and again. Recall the fact that Microsoft lowered its projection in the last quarter (and missed them again). The company is folding its two worst-performing divisions — Microsoft Business Solutions (its business applications unit) and its Mobile and Embedded units — into the Microsoft Business Division and Microsoft Home and Entertainment units, respectively. For details about Microsoft’s financial game, see some of the many previous posts (listed at the very bottom). Let’s take a quick look at some of the realistic (in-depth, as opposed to ‘Microsoft parroting’) press coverage that Microsoft received at the end of the week. Shares of Microsoft Corp. dropped more than 6% in after-hours trading after the software giant posted a fiscal fourth-quarter profit that fell short of Wall Street’s estimates as it forecast lower-than-expected revenue for the following quarter. Buying lots and lots of companies (wasting money) for increase in revenue and employees just makes the company clumsy and overweight. John Dvorak opines that the strategy of the company as a whole is misguided and hubris-driven. To make matters worse, the company is now making itself look more desperate over the new toy in the sandbox called Yahoo Inc.
We wrote about the Microsoft-Icahn duo before. They are now visibly united as they carry on with their planned proxy war. It does not help Microsoft in any way because it makes it look bad, never mind the distraction it causes. In the latest salvo in the proxy fight for control of Yahoo, the company is urging shareholders to beware of the “odd couple” — Microsoft and the corporate raider Carl C. Icahn — who are locked in a “marriage of convenience” but have no clear plan for what they would do if they took control of the board. Yahoo is now also using its Web space to attack Microsoft and Icahn, apart from describing the latter as a corporate agitator. It’s not good for business. OK, so Microsoft is on sale right now — but perhaps with good reason. The company is facing unprecedented obstacles on every side. It may run deeper than this. Consider some new observations, as follows. Shares in Microsoft were trading down 6.3% in after-hours trading at $25.78, after closing up 0.95% to 27.52. Microsoft said earlier that its online services business lost $488 million, on sales of $838 million. In the year-earlier period, the online services business lost $210 million. The entertainment unit too has some serious trouble ahead. Relative sales of XBox 360 fell sharply in the month of June and the company seems unlikely to recover, even with considerable discounts. The XBox division/unit has lost about $7 billion since 2001 and other products like the Zune seem to be approaching death. I wonder why Steve Ballmer freaks out at the thought of losing the search and advertising wars to Google (Nasdaq: GOOG), but not at handing the game-console crown to Nintendo (OTC BB: NTDOY.PK) or the music market to Apple (Nasdaq: AAPL). How is it worth throwing billions after a major rival, only to scare away the engineering talent that makes (made?) Yahoo! great? In the second case, well, let’s just throw more bad money after that Zune abomination and hope the Xbox saves the day. The Microsoft Office division numbers were a disappointment. Operating earnings there only grew a disappointing 12% for the period. The company’s online division posted an increase in revenue to $838 million from $677 million a year ago. However, losses for that division doubled to $488 million from $210 million, as management spent heavily on data centers and new employees to ramp up ad sales. Citigroup analyst Brent Thill wrote Friday that the stock’s low price-to-earnings multiple reflects investors’ fear, uncertainty and doubt: fear that the product cycle will never deliver margin expansion, uncertainty that Microsoft will ever do a deal with Yahoo! and doubt that further online investments will pay off. Gudmundson was responsible for managing Microsoft’s domain names from 2000 to 2004. Remember what Robert Bach, a Microsoft Vice President, did last year while escaping investigation or punishment. For more information, see our previous posts which are filled with many informative references handpicked from the press. Financial Games: Novell’s Main Strength? icrosoft and Openness is like the opening of a bank account. To Microsoft, what’s known as “Openness” (not Freedom) is just a business model, designed to ensure increase or at least maintenance of precious revenue streams. It’s hardly about permitting fair competition; rather, it’s a case of marketing, as Tim Bray recently emphasised. Bottom line to me? I think Microsoft sees a way to make some money with ODF, but it wants to change it to suit its own needs better. It didn’t participate in the ODF process, although it was free to suggest anything it wanted. 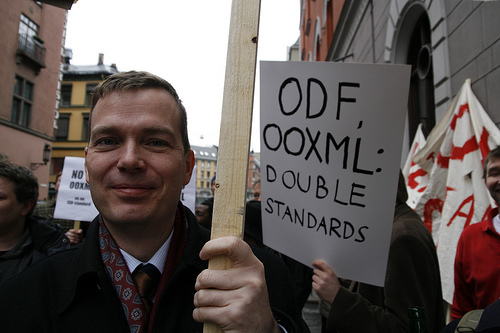 Now, when it looks like the world really does want ODF instead of OOXML, surrogates are sending a dual message — first, that ODF has won, so OOXML isn’t worth fighting any more (and anyone who does is an “extremist” anti-Microsoft whiner), and two, that OASIS isn’t able to do a good job with ODF, so the same folks who brought you OOXML should take it over. Get the picture? Is that who you want in charge of ODF? The denialists and revisionists from ISO have already tried to hide and rewrite what had happened. They potentially hope to repeat history and destroy ODF (or OASIS), too. They’ll face opposition, which they try to neutralise by being coy. Due to my past involvement in OpenOffice.org and ODF, I was curious to find out if and where the SAP products already support the ISO standard OpenDocument Format. I was happily surprised when I found out that ODF is already supported by the SAP List Viewer component (also known as the ABAP List Viewer or ALV), which is used many many times in all kinds of areas for displaying tabular data in a grid. The SAP List Viewer component allows exporting to ODF spreadsheet files in addition to Microsoft Excel files. This feature is available on systems with release numbers 6.40 and higher and works for all 3 members of the SAP GUI family including the SAP GUI for Java. For what it’s worth, here is some good new analysis from Rex Ballard. > | ODF, so the same folks who brought you OOXML should take it over. to attack us while we sleep off our drunken stupor. if you don’t save in OOXML format. have to spill to get it. > | does. They are not meeting for nothing, in my opinion. It’s not busywork. simply because they chose to use FireFox and refuse to use IE. > | actually be open. > Get the picture? Is that who you want in charge of ODF? How do you think they got control of Caldera/SCO? short time limit, before the opposition leadership can be contacted. > smiling while they do it. commercial versions of Xen, especially for the desktop. (the Judge’s very accurate observation). efforts to distribute Linux (including along with Windows). “heave ho” and let them come back with a more “flexible” offer. permit Linux machines to be displayed in retail stores. 200 of the activities that became public during the antitrust trial. Microsoft, whether we like their products or not. There have been some interesting developments in the past day or so. First and foremost, Microsoft is being sued again and this time it’s due to encryption. Microsoft Corp. is being sued by a closely held company for allegedly infringing two encryption patents in the Windows operating system. Maz Technologies, based in Wilmington, Del., “suffered damages as a result of the infringing,” according to the lawsuit filed Tuesday in federal court in Tyler, Texas. Maz seeks an injunction against Microsoft and unspecified damages. It is a Texan court, as usual. That’s where all the patent trolls go. This suit goes on top of a pile that includes the recently-disclosed lawsuit over the competition- and Web-hostile Silverlight (mentioned previously in [1, 2]). Mark Radcliffe finally explains the Red Hat settlement, which is important because he is a top gun for the OSI. This settlement was previously discussed in [1, 2, 3, 4]. Some months ago, Torvalds expressed his concern about patents and he is doing it again in this fragment from a new interview. LT [Linus Torvalds]: ‘Heh – definitely not. They’re a disaster. The whole point (and the original idea) behind patents in the US legal sense was to encourage innovation. If you actually look at the state of patents in the US today, they do no such thing. Certainly not in software, and very arguably not in many other areas either. Quite the reverse – patents are very much used to stop competition, which is undeniably the most powerful way to encourage innovation. Anybody who argues for patents is basically arguing against open markets and competition, but they never put it in those terms. So the very original basis for the patents is certainly not being fulfilled today, which should already tell you something. And that’s probably true in pretty much any area. By the way, be cautious when it comes to Linus forgers. There are people out there on the Web pretending to be him and I received an E-mail from Linus a few days ago confirming that his identity is being stolen. The legitimacy of comments in particular must always be questioned. Linus hardly ever comments in blogs. Patent Riot in the Making? Ironically, and humorously, the post is in the department titled we-could-have-told-you-and-did dept.. One of the many issues in patent reform has arisen from the unwillingness of some in the IT area to write down what they have done, and, more importantly, to read what others have written down. The kdawson post seriously neglects the PAST positions of the WSJ on patent reform, and thus becomes another piece of evidence of the unwillingness of some in the IT community to understand what has already happened. IP-Watch has a couple of new articles that discuss the issue of RAND (in standards in particular) and how it is — ironically enough given its name — used to discriminate against competitors. Here is the first article. Recall the BSA's role in lobbying. The BSA is funded by Microsoft. Along with IDC, ACT and other servants of Microsoft, they pretend to be assisting small businesses (the ‘little guy’) rather than the monopolies. The Commission promised to consider how the EU patent fee structure could be designed for easier access by small and mid-sized firms, and to try to provide IPR support services for small companies in their countries. Washington, D.C. – The Department of Commerce’s United States Patent and Trademark Office (USPTO) today announced it will extend the duration, increase the maximum number of applications, and expand the scope of applications eligible to participate in the Peer Review Pilot. The pilot, launched in June 2007, encourages the public to review volunteered published patent applications and submit technical references and comments on what they believe to be the best prior art to consider during the examination. The expansion and extension of the pilot is effective today. The pilot was initially restricted to patent applications in the computer-related arts (those classified in Technology Center 2100). The scope of the program is now expanded to include applications in the automated business data processing technologies, or business methods, class 705. Technical experts in the computer and business methods-related arts registering with the peertopatent.org Web site will review and submit information for up to 400 published patent applications, up from 250 as originally announced. No more than 25 separate applications will be allowed from any one person or organization, up from 15 in the original announcement. The pilot is being conducted in cooperation with the Peer-to-Patent Project, organized by the New York Law School’s Institute for Information Law and Policy. The pilot is extended for an additional 12 months and will end on June 15, 2009. To date, companies participating in the Peer Review Pilot have included IBM, Microsoft, Hewlett-Packard, Sun Microsystems, Intel, GE, Red Hat, Cisco, Yahoo!, and others. With the expansion of the pilot, Goldman Sachs has volunteered to join as a participant. Existing law allows the USPTO to accept prior art from the public, but it doesn’t allow the public to submit any commentary related to the art without the approval of the applicant. Thus, consent will be obtained from all applicants whose applications are volunteered and selected for the pilot. Applicants agree to have their patent applications posted for up to four months (but no less than three months) on the www.peertopatent.org Web site. Expert volunteers from the public then discuss the applications and submit prior art they think might be relevant to determining if an invention is new and non-obvious. The prior art submission is limited to 10 references. So far, the pilot’s first 31 applications have been examined. More than half of the examiners who examined an application in the Peer Review Pilot so far thought the prior art submitted by the peers was helpful during examination. More than one-third of the examiners used peer-supplied prior art in the first action on the merits. Nearly 75 percent of the participating examiners said they believed the program would be useful if it were incorporated into regular Office practice. For this pilot, applications are assigned to an examiner for examination as soon as a submission is received from the peertopatent.org Web site. This shortens considerably the time it normally takes from filing an application to a first action on the merits in the areas where the pilot is occurring. For further information on the program and to review the Official Gazette notice, visit http://www.uspto.gov/web/patents/peerpriorartpilot/.